Enjoy the delicious history behind storied cocktails as prepared by a master mixologist in a 1920s themed speakeasy. A rose by any other name would smell as sweet. A cocktail by any other would taste as good too, but there's a fascinating history behind the names of some of the most well-known cocktails out there, with intricate tales of who created them and why. You might not think to investigate the history behind the names, but in this evening event we'll be sure to delve into the their fascinating backstories, sipping along as we go. Join us on June 7th for a special evening exploring the history of several well-known cocktails and some of their surprising Chicago connections. The evening will start with a short history of alcohol in Chicago presented by Atlas Obscura Field Agent and local historian Leyla Royale. Then, you'll get to hear all about several cocktails, as presented by bartender and master mixologist Luke Nevin-Gattle. We'll take a look at the history of mixed drinks and even examine the future of cocktails in Chicago and around the world—and of course, you'll get a chance to try everything that Luke discusses. Luke Nevin-Gattle got his start in the bar industry in 2012, when he began training under Room 13’s previous Bar Manager, Ted Carlson, quickly learning the art and history of the cocktail. In 2014, Luke accepted the role of Room 13’s Bar Manager. In 2018, he took on the volunteer role of Membership Director for the Chicago Chapter of the United States Bartenders’ Guild (USBG) and now serves on the local Board of Directors. 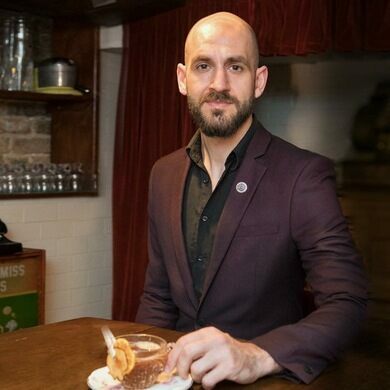 He has received numerous accolades for his work in the cocktail industry including competing in the national finals of the National Restaurant Show’s Star of the Bar competition and has also gone onto Ireland as one of the national winners of the Slane Cocktail Series. His work has been featured on Liquor.com, The Tasting Panel, and Thirsty Magazine. Follow him on Instagram at @LukeNevinGattle. The event will be held at Room 13, a secret, members only speakeasy in Lakeview. Enter through the entrance on the south side of the building, head downstairs, and knock on the door. You'll need the password (given after ticket purchase) to enter, along with your tickets. Doors for this event will open at 6:30, and the event itself will start at 7 PM. Each ticket includes samples of the drinks discussed, which is equivalent to about 2 cocktails. The speakeasy will remain open for guests until 10 PM for anyone who would like to stay a bit later. The event has limited ADA accessibility. Email Leyla at leyla.royale@atlasobscura.com for more details.